Specialty CME Credits: Included as part of the 4 credits, this CME activity is eligible for 4 Infectious Disease CME and 0.5 Pharmacology CME credits, subject to your state and institutional approval. Although group A Streptococcus (GAS) pharyngitis is the most common cause of bacterial pharyngitis in children and adolescents, many viral and bacterial infections mimic the symptoms of GAS pharyngitis. 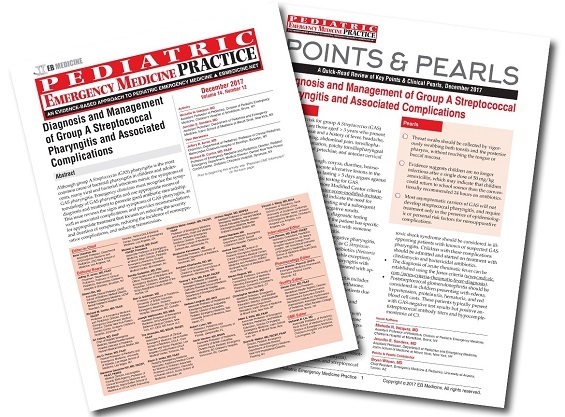 Emergency clinicians must recognize the symptomatology of GAS pharyngitis and use appropriate means of diagnosis and treatment to promote good antibiotic stewardship. 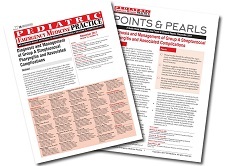 This issue reviews the signs and symptoms of GAS pharyngitis, as well as associated complications, and provides recommendations for appropriate treatment that focuses on reducing the severity and duration of symptoms, reducing the incidence of nonsuppurative complications, and reducing transmission. A previously healthy 7-year-old girl comes to the ED with a 3-day history of a sore throat and rash. Her father says she has felt warm to the touch, but he has not taken her temperature. She also has had multiple episodes of nonbilious, nonbloody emesis and nonbloody diarrhea over the past 2 days, as well as decreased appetite. Her father has been most concerned about the worsening rash on her hands and feet. The review of systems is otherwise unremarkable. She has not received any medication at home for her tactile fevers or throat pain. The father said her school sent a note home saying multiple children in the school have had the same symptoms, and he was encouraged to keep her home until she is completely better. On examination, you note that she has multiple vesicles on her buccal mucosa and tonsillar fauces, with a bilateral maculopapular rash on her hands and feet. Her examination is otherwise unremarkable. The girls's father asks whether his daughter needs antibiotics to shorten the duration of her illness. What do you tell her father is the best treatment for her current illness? This was a really good article! Thank you to the writers and to the reviewers and the editors.